The directories are naturally an invaluable resource for those tracing family history. However, there are a few points to bear in mind. This online version of Bassett’s Wexford County Guide and Directory is designed primarily as a genealogical research tool and therefore the numerous advertisements in the original book, many full page, and quite a few illustrated, have been excluded. THE baronies of Forth and Bargy are worthy of separate mention, more on account of traditional peculiarities than of any existing difference between their inhabitants and those of the rest of the county. Long before the invasion of Strongbow, owing to the nearness of these baronies to the Coast of Wales, many natives of that country crossed St. George’s Channel, and remained in Forth and Bargy. They brought with them habits which have outlived the ages since. The followers of Strongbow re-settled the baronies, possessed the fertile plains, and flourished in the mild climate. Their descendants, to a great extent, gave place to the Cromwellians, but not to the total effacement of their language and customs. The language, or dialect, has since received a considerable amount of attention at the hands of various writers, most of whom appear to have had comfort in regarding it as a curious mixture of tongues. Traces of Flemish and Welsh are found in it; but it is agreed by good authorities that it was chiefly composed of the Old English of the Strongbonians. The singularity of the traditional Forth and Bargy customs seem to have long consisted of straightforwardness, thrift and energy, combined with clock-like regularity at labor. It was, and is still, in some parts, usual with the natives to arise and repair to work at five o’clock in the morning, and to use the middle or heat of the day for sleep, or, in the Forth-Bargy tongue, entecte. This reasonable arrangement aroused the wonder of the early chroniclers, one of whom, in 1682, declared that the domestic animals and birds shared the noonday nap of their masters. For the last quarter of a century the Forth-Bargy dialect has been silent, its sound only being remembered by some old persons resident near Carne. The neat and picturesque costumes of the people have also given way to modern fashions. The men wore short coats, waistcoats, trunk breeches, and round, narrow-brimmed hats. The women, short jackets, sometimes trimmed with narrow silver lace; petticoats trimmed with colored braids, and a kercher on the head. 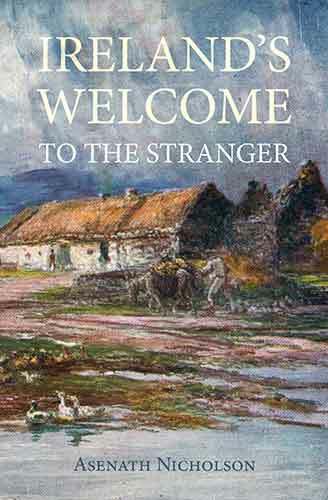 That one little corner of Ireland should have so long continued a distinct community, using a language all but forgotten by the rest of English-speaking peoples, was mainly due to the isolation secured by topographical conditions. Wexford Harbour on the east, and Bannow Bay on the south, indent the coast, and between these there is a rugged barrier, the roads leading over which are few and uninviting, and there is no navigable stream flowing through. Forth Mountain is visible from all parts of Forth and Bargy, its peaks, Carrick-a-Dee, Carrick-a-Shinna and Carrick-a-Foyle, being profiled upon the northern sky like the “features” of a well-known face, recognizable in any light. The mountain has many small freehold farms, whose crops have been raised between rocks by hardy and determined effort. A new and curious interest has been given to the grim heaps of rocks which crown this mountain by a discovery in July, 1884. While men were engaged in the removal of stones to Wexford Harbour a small square chamber was disclosed. In it were found an earthenware urn and human bones. Further investigation revealed other chambers and more bones. It is said that the stones covering this rude mausoleum were being removed some years ago by a native of the mountain for house building, and that he was stopped in the work by an accident which resulted in a severely fractured limb. Forth and Bargy, as already stated, have had many chroniclers, who have said and sung much of their pleasant bean fields and innocent pastoral life. Of the number, perhaps, none are more interesting than Jacob Poole, of Growtown, a member of the Society of Friends, and a gentle and intelligent native of Forth. A published collection of his manuscripts includes a glossary of words of the old dialect and several Yola songs.